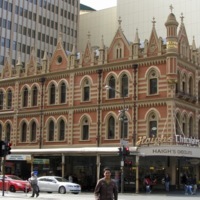 A view of Beehive Corner at the Western end of Rundle Mall in Adelaide, South Australia. This historic corner site was originally owned by John Rundle and has been known as ‘Beehive Corner’ since the 1840s. The Federation Gothic style building pictured here is the second building to stand on the site, replacing an older, plainer building erected in 1849. 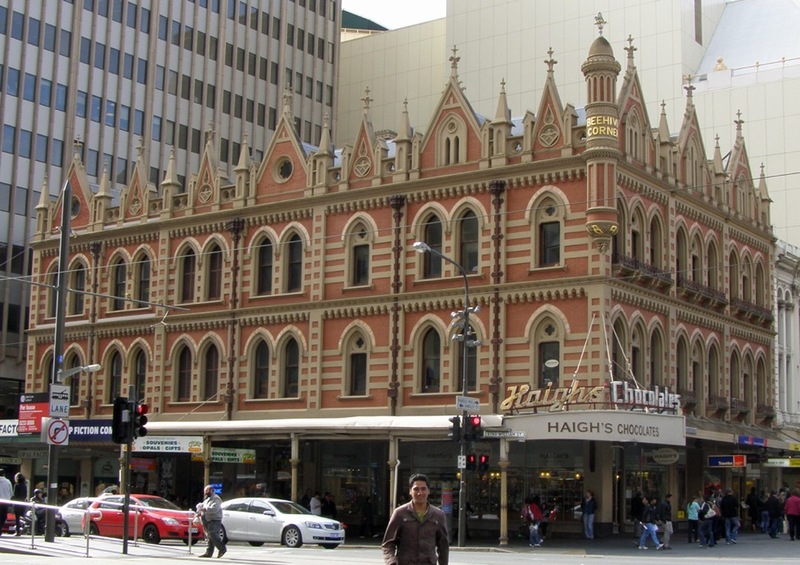 The present building was constructed between 1894 and 1896, most probably by architects English & Soward. It provides a rare example where neo-gothic architecture was used for a commercial building. Its characteristic gothic features include the lancet-arched windows with quatrefoil insets, the banded brickwork, the corbel effect, the pinnacles and the tourelle (or turret) bearing the name ‘Beehive Corner’ in gold lettering. Original features and details that had been stripped away during the twentieth century were restored in 1998. “Beehive Corner, Adelaide,” Medievalism in Australian Cultural Memory, accessed April 25, 2019, http://ausmed.arts.uwa.edu.au/items/show/499.